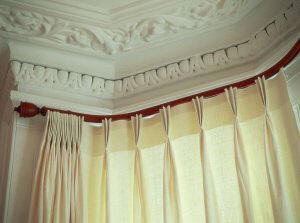 Bay windows can be tricky to dress. One really elegant system is the Silent Gliss Metropole. Custom bent, available in different finishes. The great bit is it is fitted with runners underneath, not rings. Takes a seriously good fitter to do this,which we have, and doesn't it look great!